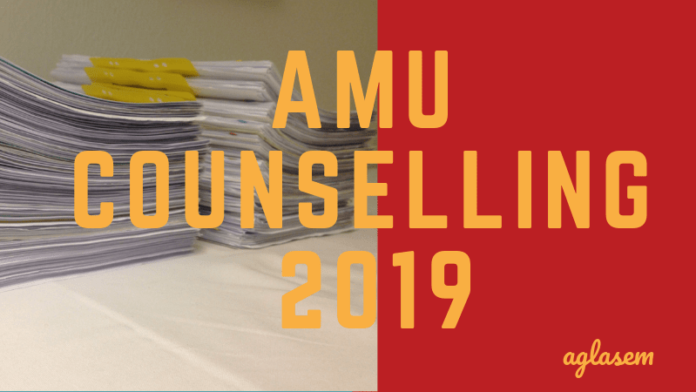 AMU Counselling 2019 – Selected candidates who had appeared for AMU entrance test are called for this final round. A notification regarding the AMU Counselling 2019 is released on its official website, www.amu.ac.in. Candidates need to do a choice filling, further on the basis of which a candidate is allotted a college. The AMU Counselling 2019 round could be conducted in the form of a document verification round or group discussion or personal interview. Physical presence in AMU Counselling is compulsory for the candidates to become eligible for admission to various courses in the respective faculty. Candidates selected for AMU admission as per University rules shall be allotted the course/ branch/speciality/subject by the Counselling Committee as per the preference of the candidate viz-a-viz the merit in the AMU Admission Test only. The list of candidates shortlisted for Counselling and the list(s) of those selected for admission will be displayed on the Notice Boards of the Faculty / College and Controller’s Office Website. The dates notified for Counselling / Admission shall strictly be followed. for Counselling/Admissions at the Venue, on the given Date and Time indicated in the Select / Nomination/Counselling List for completion of admission formalities and bring Original Documents as per details are given below. Marks sheet/grade sheet of qualifying examination (with FOUR Self attested photocopies). In case, the Original mark sheet/grade sheets/certificates are not available, the Internet Downloaded Marksheets / Grade Sheet Certificate duly attested by the Controller / Registrar / Issuing Authority of the awarding University / Board shall be accepted. Such candidates shall give an undertaking on prescribed Proforma available on our website to produce the Original Marksheet / Grade Sheet of the qualifying examination in the Office of the Dean / Principal / Coordinator / Chairman concerned by Sep 2019, from the date of their provisional admission. If any discrepancy is found in the examination result of the candidate or the original mark sheet/grade sheet is not submitted within the stipulated time, the University reserves the right to cancel the admission. Transfer / Migration and Character Certificate from the Institution last attended (if not enrolled at AMU). If the Certificate(s) is/are not available, the candidates may give an undertaking on the prescribed format to submit the same by Sep 2019. TEN (2.5 x 3.0 cms) recent front facing coloured photographs (in white background). Documents in support of Special Categories claimed in the Application Form (as given in Table III of the Guide to Admissions 2019-2020). Leave Sanction / Relieving Order from the employer for the entire duration of the course, if employed. Name Removal Certificate from the rolls of the concerned Faculty / College / Unit (if already enrolled to any full-time course of study at AMU). TWO Self-addressed envelopes bearing postage stamps worth Rs. 22/- each (to be submitted in the Office of the Provost of Hall of Residence / NRSC allotted). 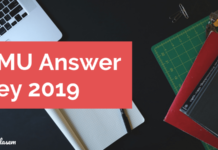 Two Oath Commissioner’s Affidavits on plain paper – one on your behalf and the other on behalf of your parents/guardian regarding not to indulge in ragging (Proforma given in Appendix VIII & IX in the Guide to Admissions 2019-2020). Undertaking before the Vice-Chancellor, AMU, Aligarh on plain paper regarding Compulsory 75% Attendance in each Subject / Course / Paper. The candidates who qualify in the entrance exam need to apply for the counselling. The aspirants need to submit their college and course choice online. Basing on the rank the officials will call for document verification. The applicants need to appear for verification on given slot of time. After the verification, the contenders will be given a seat allotment letter. The postulants need to report to the college with the letter and confirm their seat before the last date. If any student is not satisfied with the allotted college can apply for the 2nd round. There will be completely 3 rounds of the process. Admissions to B.Tech / B.Arch programs will be done through various rounds of counselling. Candidates who have obtained merit in the result of AMUEEE can attend counselling as per schedule. The lists of candidates shortlisted for next round/ counselling for admission will be displayed on the Notice Boards of the concerned Faculty/ College/Centre/Proctor’s Office/Controller’s website. After the commencement of counselling for those students who qualify the exam, The exam controller authority will allot seats for those candidates who are finally selected for the admissions in counselling rounds. The candidates have to show all the related documents at the time of counselling & admissions. 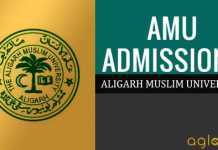 AMU will inform those candidates who will select for counselling round. Applicants will be called for the process according to the merit list. At the time of counselling, candidates have to verify their documents also. So the document verification process will also be done there. The candidates are recommended to take all the essential original papers along with their photocopies.